00:36 argyle77 How do I get gravity? 00:49 Oil_boi_minetest rubenwardy: is the call minetest.get_node_light(pos, timeofday) slower than using voxelmanip? 00:53 Oil_boi_minetest rubenwardy: but how would I get that using voxel manip? or is it not possible? Should I just run the call set_time_of_day and then return it to the regular value? 01:06 Emerald2 Since when do torches produce that level of light? 01:16 Emerald2 Sorry man, I'm not going to be anyyyyyy help. 02:33 diemartin They are nice elevators on waterfalls though. 02:37 Oil_boi_minetest diemartin: ever used the minecraft beta boats?? 03:48 cddepppp256 is there any way I can get a forum account with protonmail account? 03:51 Emerald2 Hmm wonder if any forum moderators are awake in here. 03:51 Emerald2 diemartin (kaeza) maybe? 10:26 Soni okay I'm not a fan of minetest but does it support server-side LLVM yet? 10:32 Soni and don't try to tell me "minetest isn't an engine for building compilers". because yes it is. 10:33 VanessaE no such thing exists in MT as far as I know. 10:35 VanessaE I don't personally see a use in such a thing, but meh. 10:36 Soni it's basically a glorified shell from hell. or s-hell for short. 10:36 Soni well, s-hell scripts I guess. 10:40 VanessaE I still don't see the use. 10:40 VanessaE if it's a compiler, it can be reimplemented in Lua, in theory. 10:40 VanessaE which by definition is server-side. 10:41 Soni but how would the developer download the compiled binaries? 10:44 VanessaE you still haven't told us your use case. 10:45 VanessaE WHY do you want server-side LLVM? why LLVM at all? how does it benefit...well... either side? 10:47 VanessaE more like what can LLVM do that Lua can't, in a Minetest context? 10:48 Soni oh. well, it's an optimizing compiler, for one. 10:49 VanessaE you still haven't said what it is you want to do that needs something-not-Lua. 10:49 VanessaE to do what with? 10:50 VanessaE what is your end goal? 10:50 Soni to... program in? 10:50 VanessaE to program what? a music player? an email client? 10:51 VanessaE so program those things outside of Minetest? 10:53 VanessaE so why not develop a Lua library for the job? like how we use luasocket to allow mods to make arbitrary internet connections. 10:55 Soni I think there already is a Lua library that provides LLVM bindings and I think it's called Ravi or something? 10:55 Soni what did you think I was trying to do? 10:58 VanessaE ok. then you have to code-up an external lib that you can "require" from Lua, if that Ravi thing isn't suitable. 10:59 VanessaE so it's not something Minetest has to "support", per se. 16:14 dch ahoy. is it possible to change the minimal game that is initially set up to a full game somehow? 16:14 dch or do we need to regenerate a map and lose our stuff? 16:51 Oil_boi_minetest rubenwardy: how would I set the param2 data using the voxelmaip? I know set_param2_data() is there but would I do something like data[p_pos]:set_param2_data(3)? 17:10 Soni how can I mine bitcoin with and show ads to clients? 17:25 VanessaE Soni: you can't. 17:26 VanessaE aside from there being simply no way to do it (for any crypto), mining bitcoin on a plain old CPU (or a dozen) is a losing proposition. too inefficient to make a profit, even when it's someone else's power. 17:26 VanessaE this isn't terasology. 17:27 Soni also, how do js miners work? 17:28 VanessaE they work because the webserver sends code to the client to be executed. 17:29 Soni no I mean you said "mining bitcoin on a plain old CPU (or a dozen) is a losing proposition"
17:29 VanessaE yeah. it is. 17:29 Soni so how do js miners work? 17:30 VanessaE in terms of energy used vs. money earned, it's impossible to make a profit. 17:30 VanessaE that isn't how crypto works. 17:32 VanessaE dude, just drop it. crypto mining with minetest clients to the server's benefit isn't gonna happen. 17:32 VanessaE IT IS NOT ABOUT BANDWIDTH. 17:33 VanessaE and this is not terasology, stop making such comparisons. 17:43 VanessaE to give you an example: a CPU like my Phenom II x6 1055T would do around 23-24 Mhash/s on SHA256 with a well-written program, in C or what have you, spanking all 6 cores. In Lua, with LuaJIT, single-thread, maybe a 5% of that or about 1.2 MH/s, if I had to guess. 100'000x that amount of CPU power would earn 2 cents a day. 17:46 dch more noob server questions here, how can I create a new game in server mode, using a particular mode? 17:46 VanessaE dch: define "a particular mode"
17:46 dch not minimal, for example. 17:47 VanessaE download minetest_game or another of the like, and just point world.mt at iy. 17:47 VanessaE as long as it's installed where the engine can find it, that ^ ought to be enough. 17:48 dch is that the intel phenom? how are they in practice? I toyed with getting one of those a couple years back but decided against it. 17:49 VanessaE dch: the one I mentioned is AMD. 17:49 VanessaE it's a good CPU< decent workhorse. 17:52 dch there ya go! 17:53 dch sorry to hear that. maybe ocaml's more your type? 17:53 dch also, type punning. so a recursive pun. 17:54 dch its a different mindset, some things work very well in functional systems, others not. 17:54 dch C and friends have their place too. erlang emulator is written in C.
17:55 dch nor me. I like me some erlang and I'm sticking to it. 17:55 dch I think they made me do modula2 and then I left before the java-zealotry was imposed. 18:04 VanessaE think about it. 18:04 VanessaE if LuaJIT might get you 5% of max, that's only 20x better, so you'd still need thousands of clients online all the time to even make 1 or 2 cents a day. 18:05 sofar why would you do crypto in lua? 18:06 VanessaE Soni is trying to shoehorn a crypto miner into minetest.... to be run on clients. 18:06 sofar soni: have fun, please don't bother useful people! 18:24 Oil_boi_minetest Do I do paramtype2 = 4? 18:36 paramat Oil_boi_minetest wny are you no longer using 'get light data' in your voxelmanip? 18:42 paramat i'll try to work it out ..
19:09 Oil_boi_minetest paramat: when I light a torch up snow can spawn inside the house so it seems it's outputting light level 15 for that when you call that function?? 19:32 Soni can we get file management? 19:34 paramat for what use? 20:13 Oil_boi_minetest Can I attach a particle spawner to a player and have them see it?? 20:21 zaphraud Whatcha making it do? 20:21 Oil_boi_minetest Someone should make a Linux dimension mod and whenever you mine a block it plays Linus Torvalds going "uhhh"
20:23 zaphraud That would be a violation of the Geneva convention. 20:33 Soni paramat: so, why not? 20:34 Soni what makes those more "valid" than what I wanna do? 20:34 Soni how is it any different? 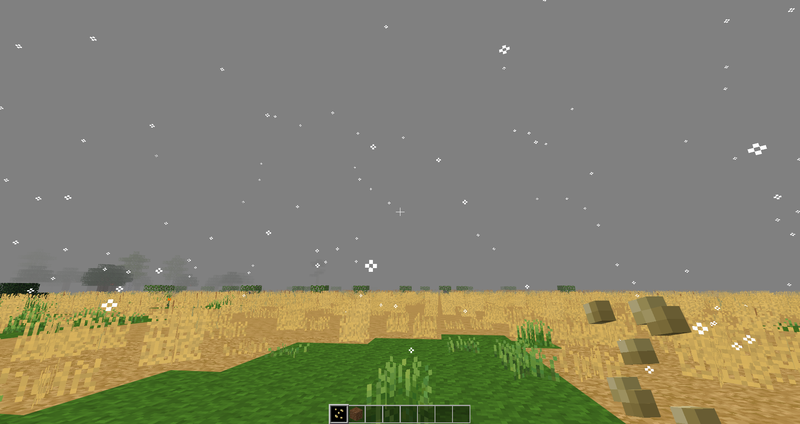 20:44 zaphraud the snow looks nice! Is it going to also generate ground cover snow? 21:01 Wikiwide How do I find horses in Minetest? 21:01 Wikiwide I see cows and deers under animals, but not horses. 21:02 NathanS21 First you need to make sure you have a mod that adds horses. 21:02 Wikiwide I have heard of mod-whinny on github, but it's not in Apper. 21:03 NathanS21 You should be able to download and install the mods directly from Github. 21:04 NathanS21 if that directory doesn't exist you'll need to create it. 21:17 Wikiwide I renamed to mod_whiny_master, it now gives some error about nil. 21:21 sy Hi. 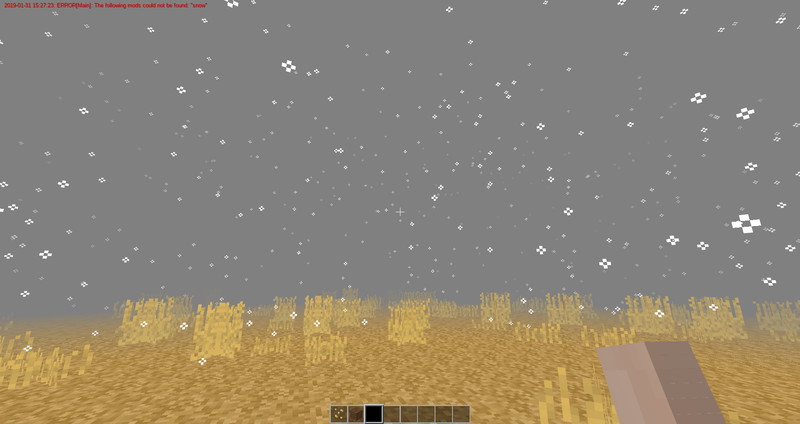 Do you think it would be possible to use minetest with OpenGL ES on a Mali (Asus C201) ? 21:21 Wikiwide Ah, I just needed to rename the directory to whinny! Works now. 21:26 NathanS21 Many times you will need to rename the mod directory for it to work. 21:26 NathanS21 With newer mods people are hopefully using the mod.conf file which removes that requirement. 21:27 Wikiwide I am not an expert, though I do have a vested interest in that - running minetest on PocketChip would be cute... And pocketchip has Mali. 21:54 zaphraud I'm just putting in a craft guide for the first time here. New to the game. 21:55 zaphraud ...the readme file is a script. wut? 22:09 zaphraud I installed https://forum.minetest.net/viewtopic.php?t=14088 Crafting guide and made sure its turned on in the mods list but have no idea how to access it in game. It doesn't just show up like it does on remote servers. 22:10 zaphraud what is sfinv? 22:10 rubenwardy "craftguide is also integrated in sfinv (Minetest Game inventory) when you enable it with craftguide_sfinv_only = true in minetest.conf." 22:13 zaphraud lol it says missing give priviledges I guess I just gotta work thru it without a step by step guide. 22:22 zaphraud I still can't access the craftguide via a book.. but that's OK.
22:22 zaphraud oh man the screwdriver is a hilarious tool. 22:48 zaphraud I love how one bucked of lava placed at the top of a hill can wipe out an entire area. 22:49 Soni does minetest even bother to use ~/Library on macOS? 22:50 zaphraud That would be a better place to store ~/.minetest ... in ~/Library/minetest. Right? 22:50 zaphraud a define statement or whatever in the makefile. 22:51 Soni does minetest even bother to use %AppData% on Windows? 23:07 paramat seen https://forum.minetest.net/viewtopic.php?f=18&amp;t=16043 for memory optimisations? 23:29 zaphraud A cactus grew but I can't obtain its blocks. 23:31 Fixer maybe is a bug? what version? 23:32 Oil_boi_minetest Fixer: Wait wait wait, mysys2 makes it so you can run linux in windows? 23:36 zaphraud yep the axe made quick work of the cactus. but it was impervious to everything else. 23:41 Emerald2 I've never been able to dig cactus with anything but an axe.